The epc635 is a fully integrated 3D-TOF imager with a resolution of 160 x 60 pixels (Half-QQVGA). As a system on chip, the epc635 contains next to the CCD pixel-field the complete control logic to operate the device. The output of the chip is 12 bit DCS distance data per pixel, which are accessible through a high-speed digital 8-bit parallel video interface. Only few additional components are needed to generate a complete 3D camera. Depending on illumination power and optical design, a resolution in the millimeter range for distances up to dozens of meters is feasible. Up to 512 full frame TOF images are delivered in rolling mode. The extremely high sensitivity of the chip allows for a reduced illumination power and reduced overall power consumption compared to other TOF imagers. epc635 is based on the same technology and instruction set as the existing epc660 QVGA TOF imager from ESPROS. An evaluation kit for the epc635 is available with hard- and software examples and a comprehensive manual to speed up system integration. 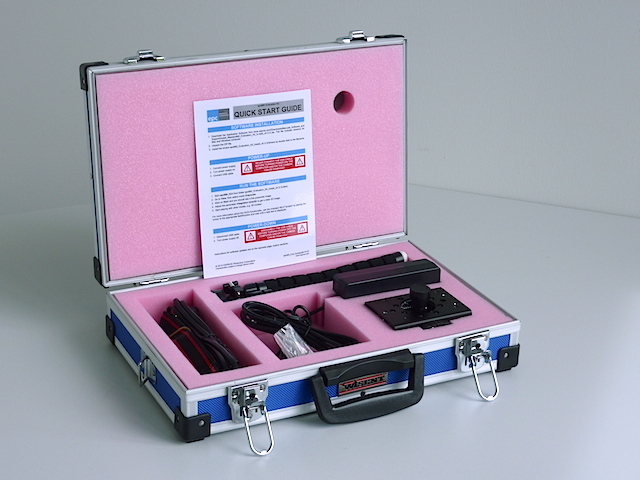 The epc635 Evaluation Kit is a fully assembled and tested camera system designed for the evaluation of the epc635 Time of Flight (TOF) imager. The foundation of this kit is the DME 635 distance measurement camera which provides all necessary hardware to operate the epc635 imager chip, including both the camera lens and illumination.